Galway East Tourism - Rathbaun Farm in East Galway, West of Ireland.Galway East Tourism - Rathbaun Farm in East Galway, West of Ireland. A real experience of traditional farm life in rural Ireland. 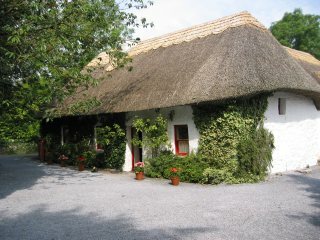 Visitors to Rathbaun Farm will be enchanted by its thatched cottage home, turf fire, stone walls and array of animals. A unique visit for tour groups and individual travellers.